Hal Ryerson and his wife, Erin, purchased Sweet Life earlier this year. Hal Ryerson’s story is a Vineyard story of the very best kind. At least it seems that way to me, and I don’t know the half of it. I admit I’m fond of the part where boy meets girl. And I’m in awe of the long hours worked and the great friendships made — between a trio of chefs, no less. But the part I like best is how it all comes together, how suddenly the Island offers up an opportunity, as if it had a mind of its own and a plan all along. Instead of starting at the very beginning of this story (which would be way back in 1952 when Hal’s father built a place up in Chilmark), I’m going to drop you right into the present and play the spoiler — unless you already know this part. Because it’s August, people; we’re on the far side of summer, and if you’re only here for a short time, you shouldn’t miss dinner at The Sweet Life Café if you can help it. Here’s what happened: Hal and his wife, Erin Ryerson were on-Island last fall, staying with friends Kevin and Suzanna Crowell (chef and co-owners of Détente restaurant in Edgartown) so that Erin could write a piece for The New York Times on the Martha’s Vineyard Cooking Club. 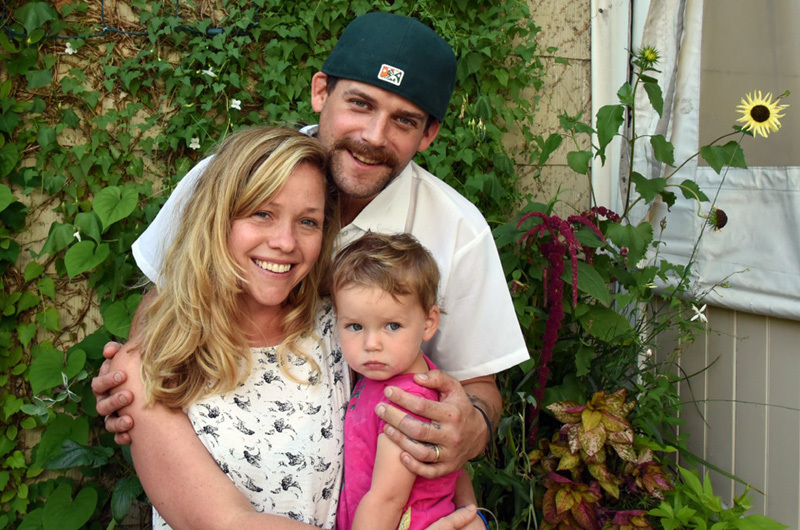 Hal and Erin, who were living in Cambridge with their one-year-old daughter Loretta while Hal cooked at the popular Inman Square restaurant Puritan & Company, spent the next several weeks thinking hard and talking often about the opportunity in front of them. And here it was — an offer coming from people they knew and trusted (Hal worked with Kevin at Détente for six years, the last of them as chef de cuisine, and Erin worked as part of the Détente team too, as waitress and assistant manager) for a restaurant with an already fine reputation, in a lovely building, in a great location. Hal and Erin made the decision to buy Sweet Life, moved to Oak Bluffs, and opened the restaurant this May after a little flurry of refurbishing. 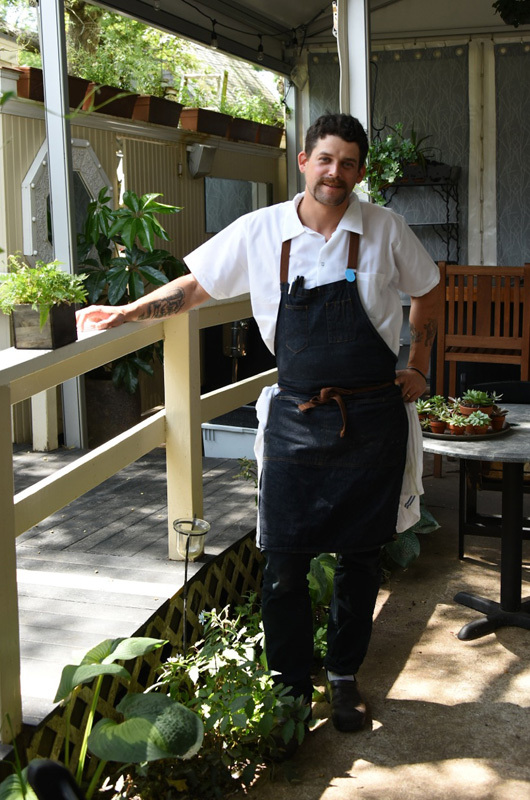 At 32, Hal might seem young to be at the helm of his own place, but perhaps not when you consider that he’s been cooking since he was a kid and studied culinary arts in high school. Once he made a commitment to go to culinary school at Johnson & Wales in Providence, R.I., the next logical step was to cook on Martha’s Vineyard during the summer, where he’d spent so many summers at his Dad’s place. 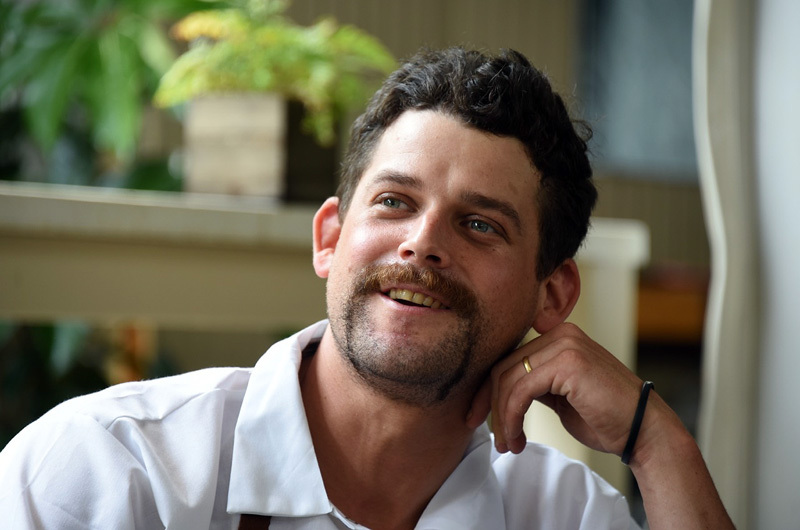 He started working at the Outermost Inn with chef Dan Sauer and wound up doing the Providence-Aquinnah shuffle for many years, even after Johnson & Wales. In 2008, Hal decided he was tired of the mainland-Island shuffle and thought he’d give year-round living on the Vineyard a go. That summer he was Dan’s sous-chef and he met a young woman who was also working at the Outermost as a waitress. Her name was Erin. They started dating and moved into a house together in Aquinnah after the season ended. Since then, Hal and Erin have worked so often together in restaurants that when it came time to make the decision about co-owning Sweet Life, they had no doubt that they could work well together. When Erin and Hal were married on the Vineyard (after a two-year stint in New York when Erin went to graduate school for journalism at NYU and Hal cooked at Northern Spy), both Dan Sauer (now chef/owner of 7afoods and Sea Smoke) and Kevin Crowell were groomsmen. That says a lot not only about the bonds that are formed in restaurants — and the year-round community of Martha’s Vineyard — but also about a certain steadfastness and loyalty in Hal. Despite his ever-present boyish grin, his backwards baseball cap, his tattoo of Curious George falling off his bike, and, oh, the nickname Dan Sauer gave him of Prairie Dog (which is a kind of burrowing rodent — sort of cute, really), he has the aura of a much older soul. Hal also has a tattoo of a Prairie Dog. Curiously, prairie dogs are known for being family animals and for hanging tight with their tribe. And Hal’s favorite thing to do on his (albeit limited in summer) downtime is to spend time with his family. Loretta is now almost two. “I take her to the beach every morning. We go foraging in the woods. We go to farms. She goes with me to the farmers’ market to pick up stuff,” he said. On the Sweet Life menu right now (Hal changes it once or twice a week), a dish of potato gnocchi with octopus, pimentón, and crispy mint is inspired by a dish called pulpo a la gallego — octopus with roasted potatoes and pimentón — that he and Erin ate often on their honeymoon trip to Spain and Portugal. That trip, which also included a surprise lunch at the famed Basque restaurant Arzak, added another subtle layer of influence to Hal’s cooking style. What is that cooking style? 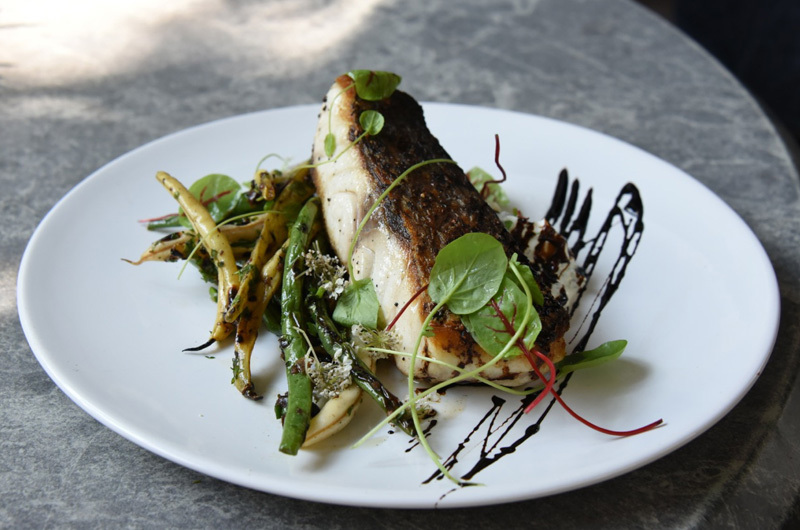 When I tasted a bite of Hal’s striped bass with grilled green beans, local squash tzatziki, olives, and a drizzle of balsamic reduction, it seemed clear that his sweet spot lies in that perfect balance of familiar, well-loved ingredients with bright, slightly edgier flavors. His presentations — along with his fish and fresh pasta dishes — are an important part of his signature: purely beautiful, not fussy. I asked Hal how he and Erin (“the brains of the operation”) are feeling now that they’re really into it, halfway through their first summer. “It’s great, super, exciting. A little tired, but having fun. Every day is exciting,” he says with a smile. “But no regrets?” I ask, unwittingly. This is a young man clearly comfortable in his (tattooed) skin. We’re glad they’re back too. Recipe for grilled summer bean salad. The black kale Caesar salad is ou of this world!